Fossil Bluff is located at Wynyard. It is easily found by following the brown signs from the town center. Please do not take any fossils from the site. 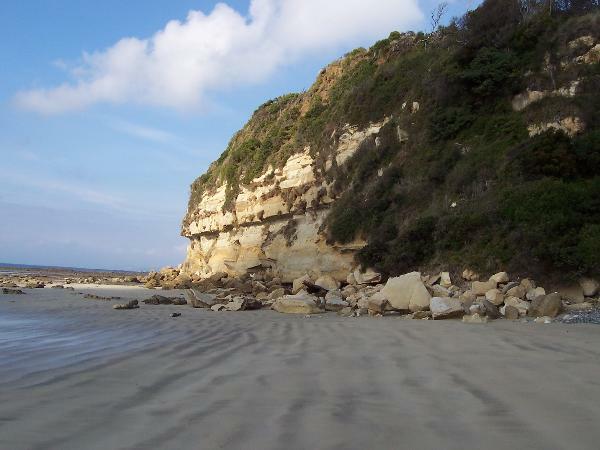 Fossil Bluff is one of the best known places in Tasmania for viewing an unusually rich fossil site. It contains both terrestrial and marine fossils in its sandstone cliffs. The site contains outstanding example of the relationship between Permian and Tertiary sediments. The Permian layer of rocks which can be viewed further around the bluff in Freestone Cove, and from the lookout were created by glacial action 280 million years ago, while Australia was still part of Gondwana. Freestone Cove contains examples of leaf fossils in the mudstone layer. The significant features to be viewed at Fossil Bluff are a section of Tertiary marine sedimentary rocks containing abundant and well preserved shell fossils exposed in the cliff face. The amazing thing is these 23 million year old shells look incredibly similar to ones found on the beach today. Walking around the Bluff at low tide, you can see some of the layers of Sandstone are laden with fossils and others are not, showing the different climactic conditions during the Oligocene period when they were deposited. To log this EarthCache you need to e-mail me the answers to the following questions. The oldest marsupial fossil in Australia was found here. It is an extinct possum that is thought to have died 22 million years ago. From the information sign near the car park tell me what it’s Latin name is. Why do you think the layers of sandstone vary so much in the amount of fossils they contain? 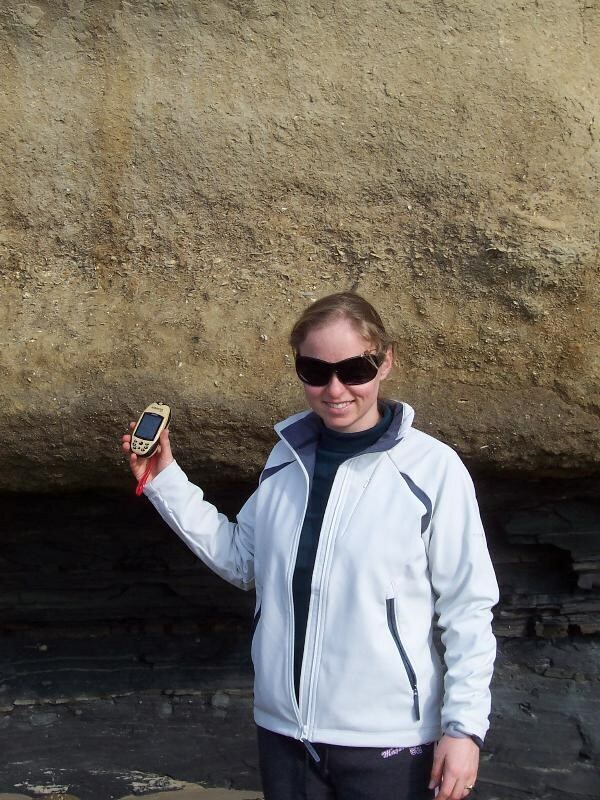 Take a photo of you and your GPSr in front of the fossils near the cliff face and post it in your log, this needs to be done at low tide. In your log please include the number of people in your group and what type of fossils you saw. You are welcome to log the cache before you receive a reply email from me, but if I do not receive the correct answers I will be obliged to delete your log. Logs that do not meet the conditions above will be deleted. NOTE: As of 1st January 2011 the EarthCache guidelines have changed and you do not have to provide a photo. However if your answers are incorrect your log will be deleted. You are more than welcome to add a photo if you so desire to your log as proof of a visit.